Aloe, genus of succulent plants with more than 150 species, most native to southern Africa. They usually have short stems, fleshy, tapering leaves crowded in rosettes at the end of the stem, and red or yellow tubular flowers in dense clusters. Species vary in height from several centimetres to more than 9 m (30 ft); they are widely cultivated as garden and tub plants in warmer regions. 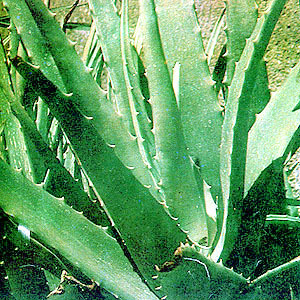 Several species are commercially important as the source of the bitter-tasting aloes used in medicine. Scientific classification: Aloes belong to the family Liliaceae. Juice of fleshy leaves is usually mixed with gogo by Filipino women and used to prevent falling of fair or as a cure for baldness. Burns and scalds: Use ointment made by mixing equal amounts of powdered aloe and coconut oil. Juice from leaves mixed with milk used for dysentery and pains of the kidney. Fresh juice expressed from the leaves is spread on skin burns, scalds, scrapes, sunburn and wounds. In small doses, considered stomachic tonic; in large doses, as purgative. For conjunctivitis, leaf juice is applied to the outer eyelid. In the Philippines, leaves used to poultice edema associated with beriberi. In small doses, used as a tonic; in larger doses, as aperient; and in still larger doses, drastically so; it is also used as emmenagogue and cholagogue. Used for sprains, sore throat. In Costa Rica, the mucilaginous pulp of leaves is used as purgative. For contusions or local edema, bruised fresh leaves are applied as poultice over affected areas. In the Arabian peninsula, used for diabetes. Juice mixed with coconut milk used for dysentery and kidney pains. For bruises, equal parts of juice and alcohol are applied to affected areas. For hemorrhoids, cuticle from leaves used as suppository for hemorrhoids. In India and the Antilles the alcoholic tincture of inspissated juice is used for bruises, contusions and ecchymoses. For alopecia and falling hair, remove the spines, cut leaves and rub directly on the scalp. The juice of fresh leave may be mixed with gugo and used as a shampoo. Used in combination with licorice roots to treat eczema and psoriasis. For burns and scalds, an ointment is prepared by mixing 2 drams of powdered aloe with 2 drams. Also used for herpes simplex sores, tendinitis, dandruff, menstrual cramps, acne, stomatitis, varicose veins, warts, hemorrhoids. This entry was posted in List of Medicinal Plants in the Philippines and tagged ALoe barbadensis Mill, aloe vera, sabila on March 30, 2009 by Pinoy Herbs. pwedeng bang itake yan internally, imean, ihalo ang juice ang katas, or gawing decoction para mainum. i mean, ihalo ang katas ng sabila sa juice [inumin].